Driving down Gray’s Ferry Avenue in 2013, it is nearly impossible to tell that the corner of Washington Ave and Gray’s Ferry Ave once housed one of the nation’s largest arsenals. Construction began for the complex in 1799, as the new United States of American needed more support to provide its military with supplies. From its construction until its demolition in 1962, the Schuylkill Arsenal provided supplies to troops, jobs to Philadelphians, and served different functions as requested by the United States Military. At the time of its demolition, the Arsenal included twenty-three buildings situated on over eight acres of land. The Schuylkill Arsenal began operation in 1800, though construction did not conclude until 1806. During its early years, the Arsenal functioned as a storage and distribution center for the military and paid annuities to the surrounding American Indian tribes that upheld treaties with the government. In 1803, the Arsenal outfitted Meriwether Lewis and William Clark for their expedition, commissioned by President Thomas Jefferson, to travel and map the nation’s newly acquired territory. After 1816, the U.S. Military used the Schuylkill Arsenal for the manufacture of army uniforms and blankets. The Arsenal provided seamstresses from the surrounding area with cut pieces of fabric, with which the women sewed uniforms and flags for the arsenal to distribute. Military widows frequently worked as seamstresses for the site, and oftentimes relied on this work completely to provide for their families. The Arsenal employed a varying number of Philadelphians, depending on whether the military was engaged in war. During the Civil War, it employed over ten thousand seamstresses and tailors to provide the Union Army with ample supplies. The Arsenal reached a second peak of employment during World War I, and became an example of solidarity on the home front during that time period. 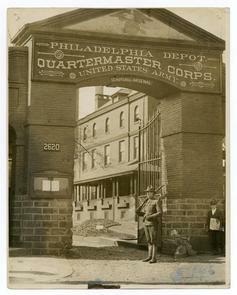 The United States Government renamed the complex The Philadelphia Quartermaster’s Depot in 1923. During both World War II and the Korean Conflict, the Arsenal served as barracks for enlisted men, as well as a recruiting and examination center for draftees. In the late 1950s, the Department of Defense decided it no longer needed the Arsenal, and began discussions with the city of Philadelphia about the site’s future. The city sold the property to Philadelphia Electric Company (PECO) in the early 1960s. PECO chose to demolish the historic site in 1963. As of 2013, a similar site existed at South 22nd St. and W. Oregon St, known as Defense Logistics Agency Troop Support. Visitors to the site of the former Schuylkill Arsenal can view a historical marker describing Lewis and Clark’s Expedition—only a fraction of the rich history connected with the site. Washington Ave. and Gray's Ferry St.